New and exciting changes for Ho-Chunk college students are happening within the Higher Education Division. The Ho-Chunk Nation Higher Education Division has updated a few processes to meet and adjusted their Funding Policy to meet changing needs of Ho-Chunk college students. On Monday, July 9, 2018 the Higher Education Division launched its new online student portal. 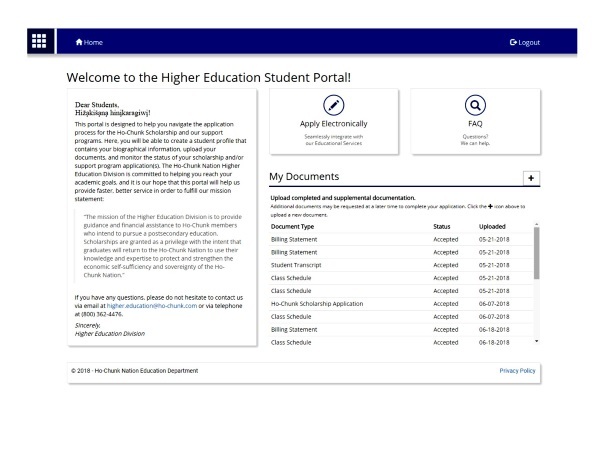 The new platform developed by Sam Bristol from Informational Technology enables Ho-Chunk scholarship applicants to manage their information and upload required documents online. Ho-Chunk college students also have access to Higher Education Division’s support programs via this platform. Ho-Chunk Scholarship applicants from academic years 2015 through 2018 already have a profile created by Advisor, Erin Roberts. New applicants and applicants before the academic years mentioned, must create a profile. Instructions on accessing your profile or creating a profile can be found at https://education.ho-chunk.com or students may call for help at (800) 362-4476. Security precaution and privacy statement for the website have been addressed. The website has been secured using a Secured Sockets Layer (SSL) that encrypts information. The Higher Education Division collaborated with the Ho-Chunk Department of Justice on a Privacy Statement that informs applicants about the ways their information will be used. This statement is located on the student portal. When students submit sensitive information via the website, that information is protected both online and offline. Only employees who need the information to perform a specific job are granted access. Both computers and servers which store information are kept in a secure environment. Applicants still have the option to submit a paper copy of the Ho-Chunk Scholarship Application or email required documents. Dr. Lewis says, “This year will be a transition year.” Both students and Higher Education Division will become acquainted with new processes and work out any bugs in the system. Ho-Chunk students may also apply for support programs via the student portal. These support programs include the College Access Program, Special Request Program, and Postsecondary Student Loan. College Access Program assists with reimbursement of fees including entrance preparatory courses, entrance exams and tests, and application fees. Special Request Program provides achievement incentives for degree completion, funding for study abroad programs, and funding for professional development opportunities. The Postsecondary Student Loan provides financial assistance for specific educational purposes. On June 26, 2018 the updated Funding Policy for academic year 2018-19 was approved by the Executive Director of Education, Nehomah Thundercloud. The updated policy can be requested by email at higher.education@ho-chunk.com. Four major changes appear in this policy. The Higher Education Division updated their summer funding program, their official transcript process, eliminated the Academic Plan, and increased full time scholarship amounts. The switch was made from Summer Tuition Assistance to Summer Scholarship. Funding for the summer term is no longer a support program. More and more degree programs are requiring college students to attend year round and the Higher Education Division adjusted the summer program accordingly. In addition, they increased the number of eligible summer terms based on degree level and are calculated cumulatively. One-year degrees and certificates are eligible for one summer term, Associate degrees three terms, Bachelor degrees six terms, Master degrees eight terms, and Professional or Doctoral degrees ten terms. Another change involves official transcripts. Scholarship applicants are required to submit an official transcript to close out previous funding. The official transcript must display satisfactory academic progress in order for continued funding. The Higher Education Division now accepts electronic transcripts. Electronic transcripts may be sent to higher.education@ho-chunk.com directly from a school or its clearinghouse service. In prior years, Scholarship applicants were required to complete and submit an Academic Plan and have it signed by an advisor at their school. This requirement no longer appears in the Funding Policy. Case managers may request applicants provide an advisement report when certain student situations arise. An advisement report is typically available online in the school’s student account area. Lastly, the Higher Education Division increased scholarship amounts for full time students. Undergraduate students are eligible for up to $10,000 per standard academic year or $5,000 each semester. Graduate students are eligible for $24,000 per standard academic year or $12,000 each semester. Graduate students are eligible for a living expense consideration at a prorated amount.